Must I be a Citizen to Vote? Sarah Palin was criticized for proclaiming the year 1773 as an important date in the Tea Party movement. Christine O’Donnell was criticized for pointing out there is no “separation of church and state” clause in the United States Constitution. As it turns out, both women were correct, but our anti-Republican culture jumped at the chance to exploit their perceived inadequacies. Politico has a pretty good analysis of the attack on Christine O’Donnell. 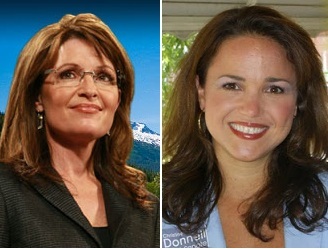 Michelle Malkin reports on who went after Sarah Palin. The dust-up on Christine O’Donnell is an example of “the standard AP re-write.” This is where an Associated Press reporter releases a story and then updates it later in the news cycle. In the case of reporter Ben Evans, he released his story on Ms. O’Donnell at 12:54PM on October 19, and then posted a rewritten version at 9:27PM later in the same day. Depending on which version you read, you received a different sense of the debate. It’s a good example of how early stories capture the stronger anti-Republican themes. Reporters typically will temper their bias as events unfold. The fascinating thing about the criticism of Governor Palin is that it first appeared in the form of text messages on the Twitter accounts of commentators. Many pundits send short text messages – “tweets” - to a Web site to register their impressions of events. It is a remarkable window into the way they interpret their surroundings. I’m betting that as time goes by, we will see more analysis of the way people in the political arena use Twitter to react to their world. If it is true that first impressions are the most honest, it will be enlightening to watch as they share their true feelings.